Gruul is one of my favorite guilds – which is kind of ironic, since the other is Orzhov, and those two are enemies in every sense. I’m always happy when Gruul gets a card that offers a dimension other than the obvious things like ramp strategies or amassing +1/+1 counters and such. The specificity of Domri’s Nodorog does limit its use, and it’s probably not the most impactful possible thing that the guild can be doing with five mana. Two toughness also makes it easier to deal with than some five-mana threats. I do, however, like that it is a good play either before or after casting Domri himself, and I also like that casting it when Domri isn’t in play means your opponent will need to have a plan for both it and a planeswalker. When they don’t, you’ll often run away with the game. I’m not entirely sure what a nodorog is supposed to be, aside from vaguely beastly. 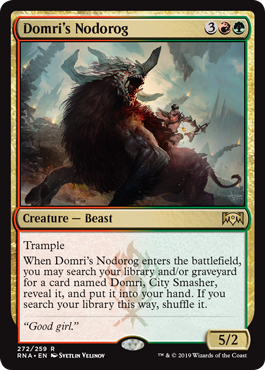 But the idea is simple: use Domri’s Nodorog to search out the big boy himself the turn before you cast him. And while a 5/2 is not going to be the Beast In Show by any stretch, it does trample to make nice work of blockers and still get through. If you’re in on the bad Domri, this is a nice way to help with redundancy and provide a vaguely warm body, which is always a good thing!